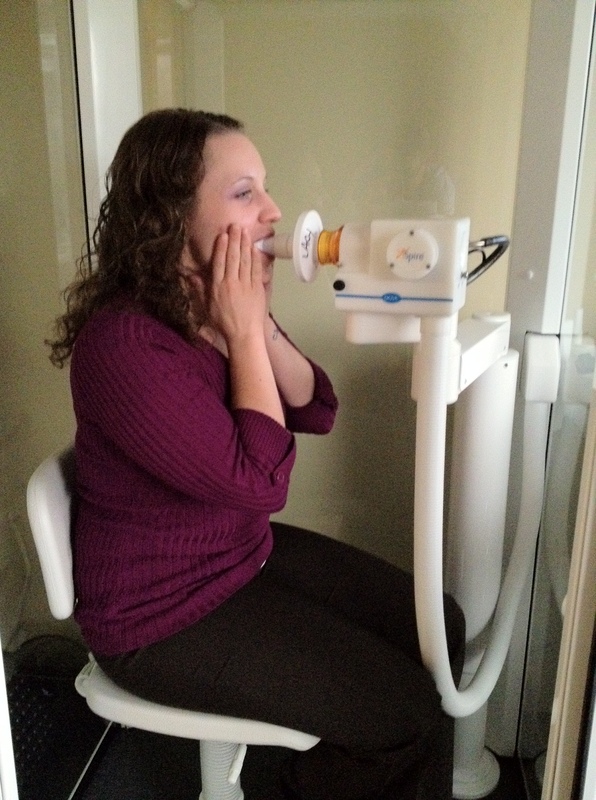 Pulmonary Function Testing (PFT) tells us how well your lungs function, and the results are used to follow the progression of a disease and its response to treatment. PFTs can also be used to assess if there is adequate respiratory function to withstand surgery. Your doctor can get a lot of information about your lungs and how they are functioning by a series of tests called pulmonary function testing (PFT). The tests will show the volume of air you are breathing, how efficient your lungs are in moving air in and out and how well oxygen is delivered to your bloodstream. You will be given specific instructions for preparing for your PFT, but you should not smoke for at least six hours before your test. Check with your doctor about the medications you are taking and what you should continue to take before you are tested. Avoid caffeine, exercise and exposure to cold air before your test. You can see from the picture that you will be tested in a special laboratory. The tube that you breathe in and out of is connected to various machines, which will give your doctor the necessary measure. During the test, you will be seated, as in the picture, and the technician will explain how to use the equipment. You can take rests if needed during the test, especially if you’re light-headed or short of breath. The test should not cause any side effects but you might feel tired afterwards. Within a few minutes, your doctor will have the results and will determine what type of treatment you need.